Alive and Young: The New Nietzsche ... err Russell ... umm A fool is a fool. The New Nietzsche ... err Russell ... umm A fool is a fool. Once again we have another great composer of claims who fails to support any of those claims with valid logic. Wit is nice, but intelligence is even better. Proof: Because I think there is no God. Reason for Belief: Christianity is hard. It is easy to stand on the outside and poke fun at those people on the inside, but dang it, at least first take the people you are making fun of seriously. If you can't take something seriously, no rights should be given to those comments made by said unserious person, for how can an unserious person even begin to comment upon a serious subject? Why is it always the case that belittlement and snickery are the instruments of those people who are too simple minded to see past the end of their own noses. Claim: All religions are false. Proof: Religions have similar aspects, stories, teaching, etc about them. Reason for belief: Forgot to look at at the religions and see that to say that two or more things are alike is the same as saying that two or more things are not alike. (sounds like someone took too many comparative lit. classes in college). Claim: Religion is the problem. Proof: Religions people do bad things. Reason for belief: 1. Doesn't take the bible nor the religion seriously, so he won't do the research to discover the real meanings of the biblical texts. 2. If the Bible doesn't contradict itself then one's attitude and lifestyle must change. In short, this is just the same recycled garbage that has been around for 1000s of years, even more so over the last 200. After all, there is nothing new under the sun. 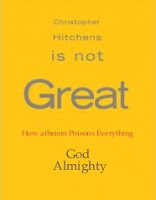 Please Mr. Hitchens please stop thinking, or if you do think at least try to be original about it.